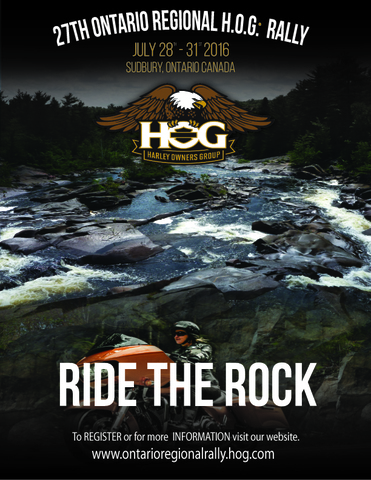 Events | Ontario North-East H.O.G. Ride Information: Riders will meet in their respective communities as listed and ride together to meet up with Riders from different Northern Ontario and Abitibi-Témiscamingue communities for Registration in Kirkland Lake, ON. 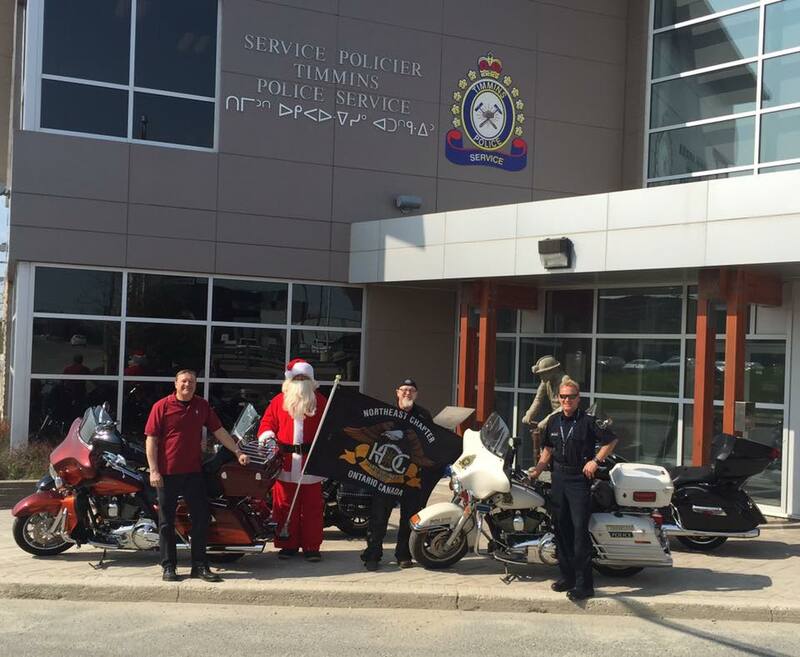 Riders will then participate in a unified Ride (duration ~2 hours with a rest stop half way) before returning for Rider Rally featuring Awards, Prizes and community BBQ lunch (included in your registration fee). Invite all your friends. All types of bikes are welcome. The general public can also donate toys and non-perishable food items. Timmins Police Pipes & Drums will be leading the initial procession from police headquarters on Spruce Street South. Entry requires each participant to furnish an unwrapped children’s toy or a non-perishable food item. 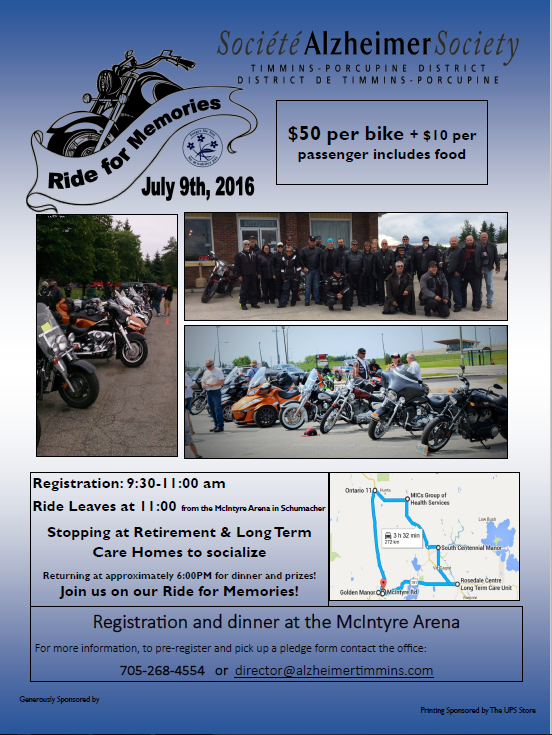 The Ride for Memories is an event with the purpose of bringing awareness and understanding to the needs of caregivers in the Cochrane and Temiskaming Districts. The funds raised by this event are used to ensure that services offered by the Alzheimer Society of Timmins-Porcuine District Inc. are available to clients and caregivers in our area. We will be stopping at Retirement & Long Term Care Homes along the route to socialize and offer support and encouragement to the clients we have in neighbouring communities. Returning at approximately 6:00PM for a BBQ and live entertainment! Please join us on our Third Annual Ride for Memories! Registration will be open all day Thursday, Friday, and Saturday morning. Why not arrive in Sudbury on Wednesday so that you can get an early start on the many rides that we have to offer? Guided Rides and a Self Guided Poker Run are planned as well as rides that you can do on your own. If you get tired of riding, we will have lots of activities going on around the Rally site: On and Off Bike Games, Show and Shine, and lots of entertainment at Bell Park and at The Rock Harley-Davidson. We will also be looking after your stomach with 2 dinners included in your registration fee, on Friday and Saturday, plus a pancake breakfast sponsored by our Dealer on Sunday morning. We do not want you to go home hungry! Missing an event on the calendar? Contact us and we will add it.